Shotei - Born in Tokyo, Takahashi Shotei studied drawing and designed book and magazine illustrations early in his career. His big break came when he was hired in 1907 by Watanabe publishing to create woodblock print designs as part of the "shin-hanga" or new prints movement. 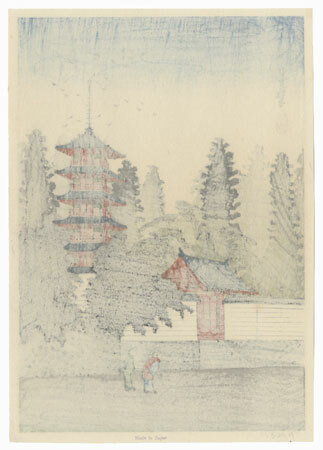 As the first artist to work for Watanabe, he designed hundreds of prints for him, more than any other shin-hanga artist. Specializing in landscapes, he designed works in a variety of styles, but is most recognized for his beautiful twilight or nighttime scenes and atmospheric weather conditions such as rain and snow. His lovely prints have a wonderful graphic appeal and make beautiful framed displays, and are a great area of collecting for the shin-hanga enthusiast. 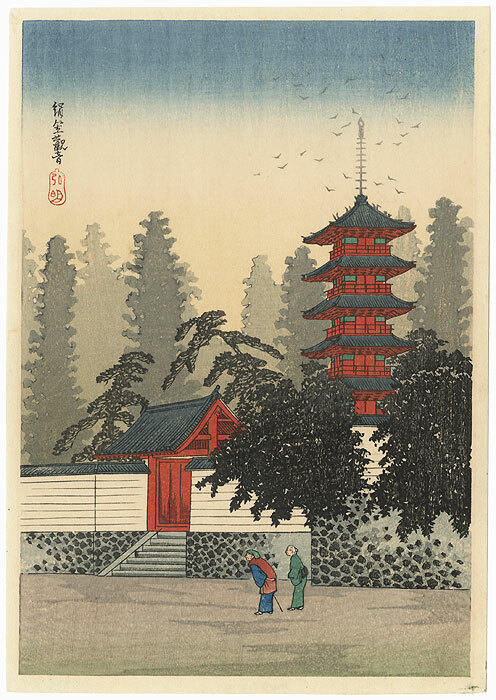 Comments - Lovely shin-hanga view of the Temple of Kinugasa as the sun begins to set. 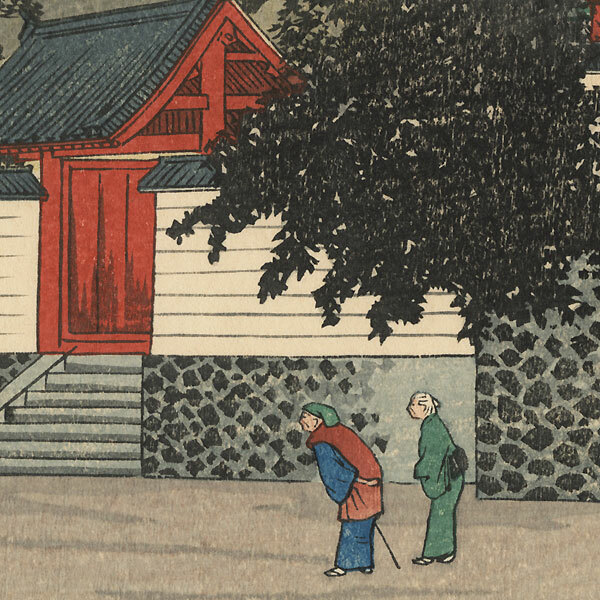 An elderly couple makes its way across the foreground, with stone steps behind them leading up to an entrance gate to the temple. Trees are silhouetted against the horizon, with birds wheeling about the top of the pagoda at right. A beautiful design with soft bokashi shading and handsome wood grain impression in the background. Stamped "Made in Japan" on reverse. Condition - This print with excellent color and detail as shown. Slight toning. Please see photos for details. Very nice overall.